Goodbye Colitis was the only logical post title I could think of for this post where I’m sharing with you my results from the recent Colonoscopy and Endoscopy. Some time ago, I had all my 2008 Colonoscopy and Endoscopy results faxed to me. Admittedly, only recently did I review the results with a fine-toothed comb. There is one focus of mild active inflammation in two adjacent crypts. No crypt abscesses, no chronic crypt changes, no granulomas or neoplasia is present. This degree of inflammation can also be seen secondary to bowel preparation which is slightly favored over self limited type colitis. Did you catch that? “This degree of inflammation can also be seen secondary to bowel preparation…..” and that that theory was, in fact, favored, over the colitis diagnosis. I continued reading those records and notes from 2008, and shortly after that initial 2008 diagnosis (about 2 months), I went in to see him again – still with the same bloat issues. However, at that time, I told him I had stopped Canasa because I thought it wasn’t helping and making me worse. And that was the end of that. The medical records with that doctor (the one who diagnosed me with Proctitis) stopped there. If you’ve ever read my full story (or even the post I wrote on Reactive and Proactive Health), you know that I stopped the Canasa because I thought it was doing me more harm than good and that’s when I got really serious about healing my gut as naturally as possible. Fast forward 10 years. A few weeks back I had another Colonoscopy and Endoscopy because my doctor(s) have wanted to rule out anything serious for why the SIBO keeps relapsing (Dr. Schweig in California wanted this done quite some time ago, and my new doctor in Minnesota kept on it so we made it happen quickly). That day, immediately after the procedure, they knew my Endoscopy looked good (which is huge progress from the inflammation last time). However, they did take biopsies from the Colonoscopy because they mentioned possible mild inflammation. During your upper endoscopy performed on July 19, 2018, we did not see any significant abnormalities or inflammatory changes. Biopsies were taken from the small bowel and stomach did not show any concerning changes. During your colonoscopy performed the same day, we also did not see any significant abnormalities. Biopsies taken from the colon did not show any inflammatory changes and overall the small bowel and colon looked good. Based upon what I saw, I don’t even have Proctitis as I was diagnosed with 10 years ago. It also doesn’t appear that there is really anything too significant. Is that correct? Good news indeed. So from an eyeball perspective the colon appears normal. I will request an appointment for next week or the following (we return from Italy on Friday) because I’d love to figure out next steps to ensure SIBO does not relapse. I am highly disappointed that for the past 10 years I’ve lived according to mis-diagnosis of Proctitis. I’m sure you can understand that. And with those final conclusions, I’m going to give you my real, raw, and honest thoughts here…..because that’s what I strive to do every single day on my blog. 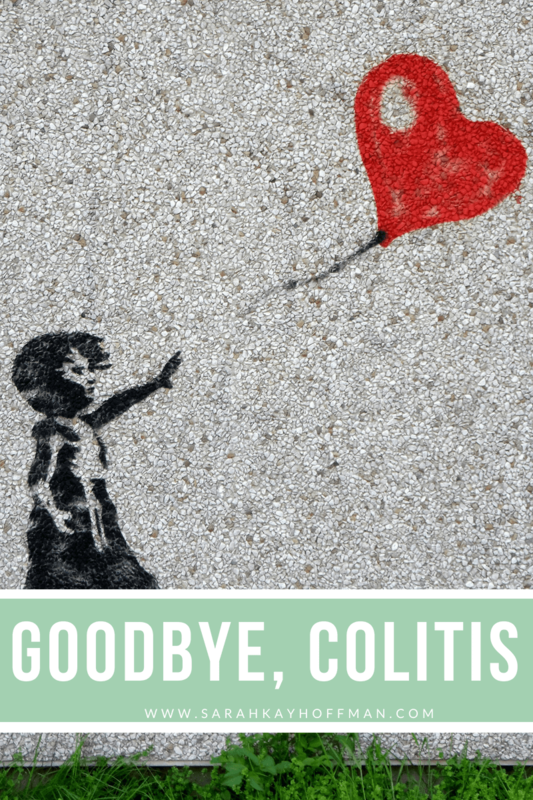 Click HERE to save ‘Goodbye Colitis’ for later. My gut feeling tells me that I never had Colitis (Proctitis). I believe I lived thinking I did for the past 10 years, and if you want to know how it made me feel when I first realized it (upon reading the report from 2008), the answer would be……livid and semi-nauseous. The first thing I did was feel blame – on myself. Blame that I didn’t connect the dots better; that GI doctor was always wrong for me so why did I just accept his diagnosis without really digging into those words he wrote? And blame, then, that I would spend the next 10 years with the idea that I had Colitis, I was ill, I would always be this way, blah, blah, blah. But after the blame period wore off, I started feeling optimistic and grateful for the real diagnosis (leaving the past in the past) and realized that even with believing I had Proctitis these last 10 years, I still became my own hero in all of it. Even just two short months after that diagnosis, I knew something was off, and I listened to my gut. I knew I wasn’t getting better with the Canasa, and I knew that his medicated suppository was a bunch of BS. I took every last piece of it (the diagnosis/mis-diagnosis) to study (I went back to school and to this day take ongoing educational courses), research, investigate, implement, write, read, etc, etc. all things gut, gut health, and gut healing. 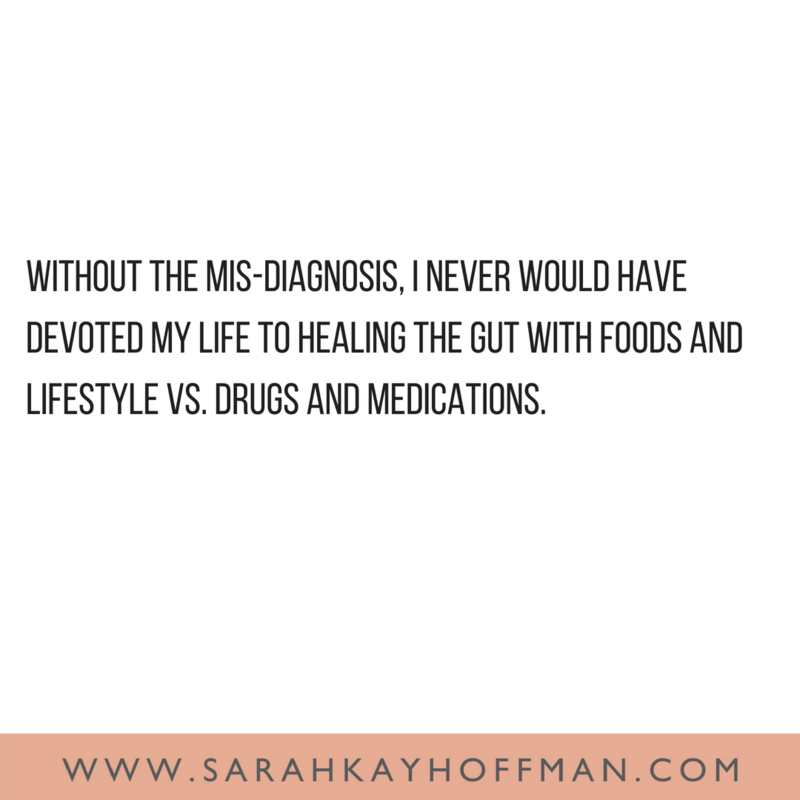 Without the mis-diagnosis, I never would have devoted my life to healing the gut with foods and lifestyle vs. drugs and medications. At the end of the day, even though I didn’t have Proctitis, my gut was still a mess, I was still sick and in misery with my gut, and the true diagnosis would still not be uncovered until 2013. On the other side of this, I can tell you that I firmly believe this whole time it was SIBO (and only SIBO, maybe something else, but not IBD) all along. I have had the classic SIBO symptoms since that awful, horrible bout of illness my freshman year of college. Canasa would have never helped the SIBO. I let these final Colonoscopy and Endoscopy (I won’t have to re-do it again until I’m 50!) reports settle with me for quite some time now. I have gone through all the emotions, internally (not with anyone else – in fact, I have barely even told my own mother about the results, and I haven’t even described the thoughts with Ryan), trying to figure out if I’m happy, angry, frustrated, or what. And the answer? All of it, sprinkled with this new optimism I described above. 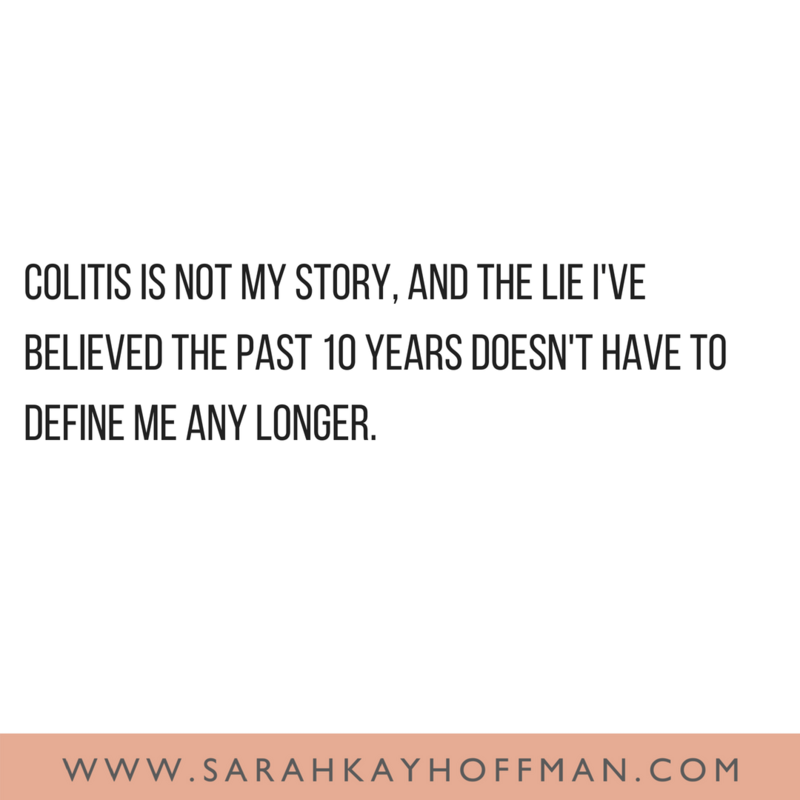 Colitis is not my story, and the lie I’ve believed the past 10 years doesn’t have to define me any longer. I might battle the ebbs and flows, the ups-and-downs, the triumphs and battles of SIBO for quite some time yet but even SIBO won’t define me any longer. And when I arrived in this place, sound and calm, something else erupted, and if you stick close by I’m going to share it with you next. p.s. I am likely to get a ton of questions from this post, so please either leave them in the comments below or email me directly HERE. Wow! I am so happy for you!! Do you have any theories what caused your SIBO to occur in the first place, and why it keeps reoccurring? Will you now do anything different regarding treatment? I have two theories: 1. A history of not eating enough, “diets,” and tinkering with food which lead to decreased stomach acid and then 2. Triggered by that illness my freshman year of college (an illness like that oftentimes triggers it). And no, nothing will really change because I have only been focused on the SIBO for quite some time now. I will have to revisit the use of LDN, but my guess is that we’ll continue it for motility. Hi there. So happy for your results. Don’t you think that the change in your eating habits thinking you had colitis is what helped heal your gut to get the results you have today? 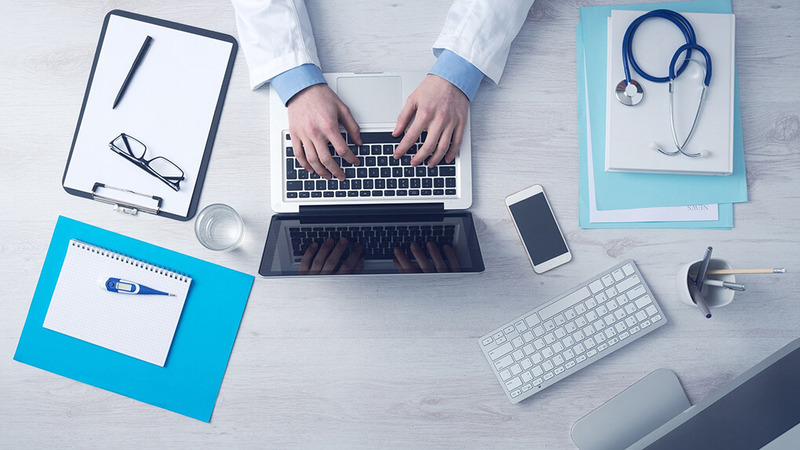 Why do you feel you were misdiagnosed? I’m currently icing with colitis as well. Do you recommend a colonoscopy and endoscopy test? I’ve had digestive issues for years. I have all the symptoms of SIBO. Do you think these tests could help me get some more answers?